The NEW PANTONE Formula Scale 3 - LC has been developed specifically for producing smaller mixes of PANTONE Colour Inks, up to 1kg. This meets the needs both of larger printers seeing a trend towards shorter print runs and faster turnaround, and of smaller printshops who are generally neglected by the ink companies. A key feature of all PANTONE Formula Scales is that the formulas for mixing the PANTONE Colours are ready programmed into the scale memory. It makes mixing the inks quick and easy - you just enter the PANTONE Number and ink quantity required, and the scale automatically does the calculations and steps you through the weighing process. As with other PANTONE Formula Scale 3 models, it comes ready programmed with ALL the formulas contained in the standard PANTONE Formula Guide (including metallics & fluorescents), and the latest colours in both the PANTONE Metallic Formula Guide and the PANTONE Pastel Formula Guide, and now with the NEW PANTONE Goe™System Colour Range. The large backlit display provides detailed information at every stage, with numbers displayed in large digits - so the scales are really easy to use. You are guided through the addition of the base inks by a progress bar, and can then use the weight indicator for the precise amount. Should you miss out any of the bases, or not be within tolerances, you will be warned before you quit the mixing sequence. You simply select the PANTONE Colour you want to mix, enter the quantity, then put a container onto the weigh pan and step through the mixing sequence. 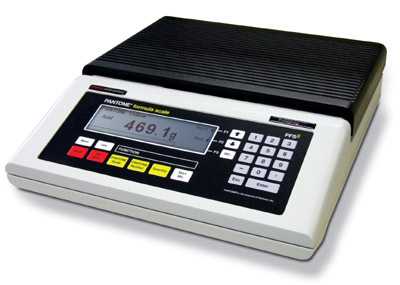 The scales will compute the exact amounts of each of the base inks required, and warn you of any potential problems. Context sensitive information is available at the touch of a button, so you can easily check a formula, the quantities of base inks required or the progress of the mix. You can also select from a number of options, including a choice to work in kg or lbs. The PANTONE Formula Scale 3 - LC has an enhanced weighing resolution of 0.1grams, so accurate mixes of very small quantities can be achieved, from just a few grams, up to a maximum of 1,000 grams. For those who still like to work with imperial measures, the scale can also be set to work in pounds with a capacity up to 2 lbs. The low cost of the new LC models means everyone can enjoy the benefits of using the PANTONE Formula Scales, even the smallest printshop. There is no waiting for special colour inks to be delivered, and no messing about getting the formula right. Save by using lower cost base colour inks, and mixing just the amount for the current job. After all, when it comes to reprints, you know you will be able to get the same colour again!